Hello, and on behalf of the entire nationwide chain of Neon Bouquet Wedding Chapels (NBWC), thank you for choosing one of our many fine franchises in which to celebrate your special day! Operating in many locations around SimNation, we here at NBWC follow the same tried-and-true methods that have led to outstanding successes in fast food, retail shopping, and travelling carnivals- we do everything we can to make sure that whether you're marrying the love of your life (or just your latest fling- we won't tell! ) 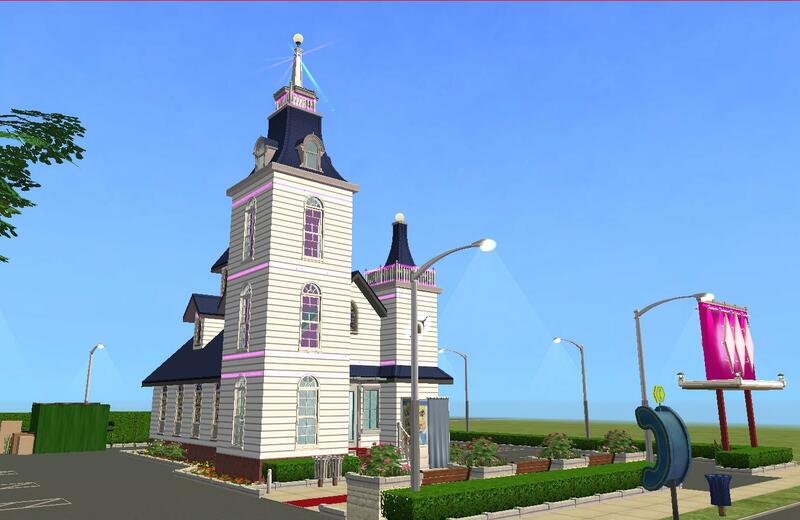 in Pleasantview or Strangetown or Belladonna Cove, you can rest easy knowing that you'll be met with the same high standards you'd find at our flagship chapel in Sim Vegas, NV. Before we get into all the package weddings that we offer our clients, please allow me to give you a tour of our facility! Did you once dream of a destination wedding in a picturesque New England chapel, with a peaked steeple and white clapboard siding? Well, you're in luck! 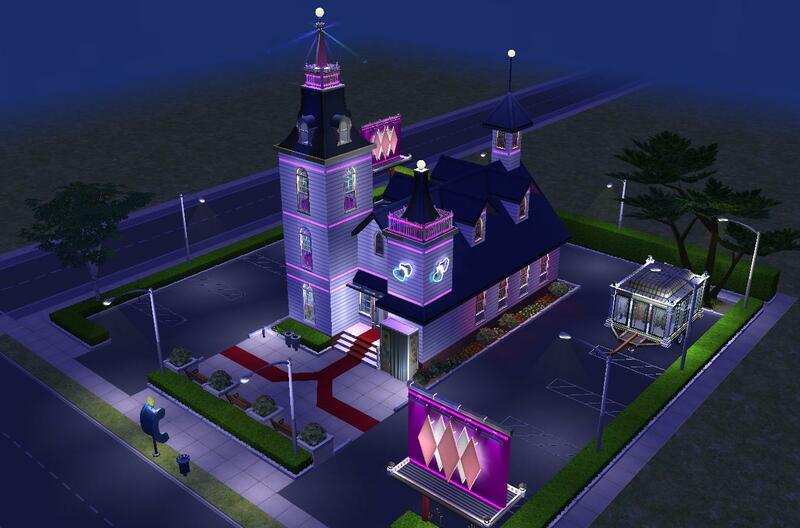 All Neon Bouquet Wedding Chapels are modeled after one of the most beautiful of SimNation's historic wedding chapels. Sadly, the original church has since been almost totally destroyed, since by company policy, every NBWC franchise must include a piece of the original church. Isn't it nice to know that the place where you'll spend your special day includes such a valuable piece of SimNation's cultural heritage? As you approach the door to the chapel, a red carpet will guide you towards your 'happy ever after," and just up the stairs, the leaded-glass doorway opens, welcoming you, your future spouse, and your guests, into the chapel itself, the site of your dream NBWC wedding! 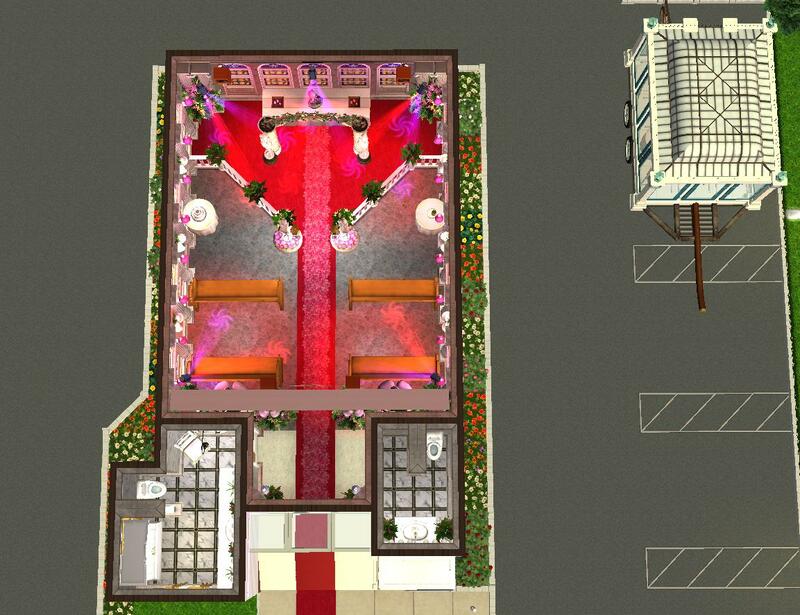 Just inside the door are the bride and groom's individual dressing rooms. 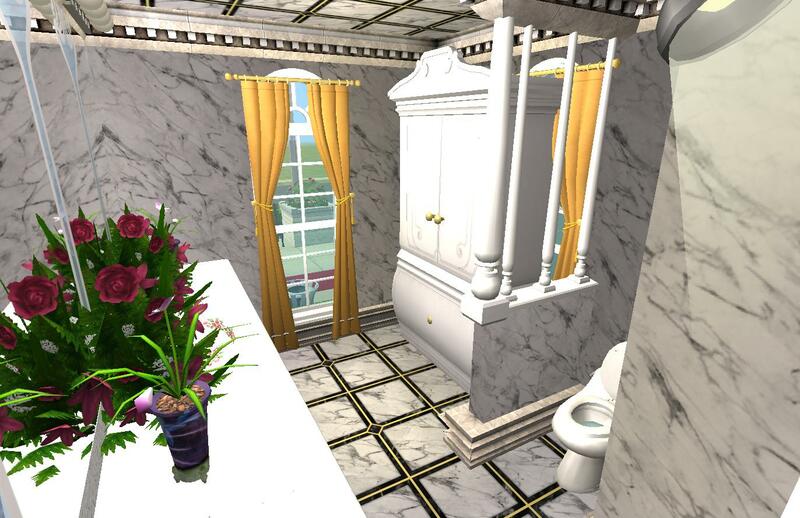 Obviously, the bridal party needs more space to get into the elaborate dresses that any Neon Bouquet Wedding Chapel wedding entails, but both of these white marble rooms offer a lovely clean space to prepare for your walk down the aisle. The chapel itself is decorated to show of the NBWC company motto, "Why wait until after the ceremony to start the party?" Neon lights, vibrant colors, vacuum-tube speakers playing the latest sultry R&B tracks, hundreds of freshly-cut flowers (changed weekly), and a new rosepetal pathway to the altar for each service help ensure that your wedding is not only a day to remember, but also that you'll have no trouble moving right into the afterparty (or at least, your guests won't, if the bride and groom have to make a quick escape!) Included in every NBWC ceremony are two bears to "bear" witness to the nuptials, as well as the services of our very discreet staff- we promise, you'll never even notice they're there! 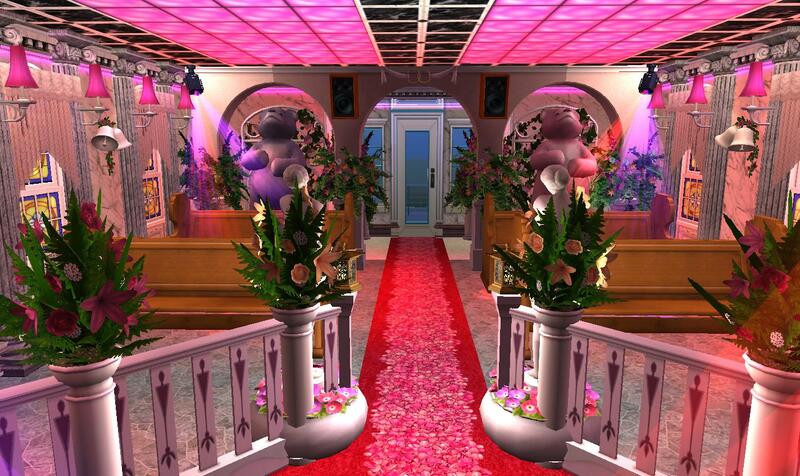 As a final note, this Neon Bouquet Wedding Chapel franchise is thrilled to announce that we have reached 2 new partnerships with some of SimNation's best known names. 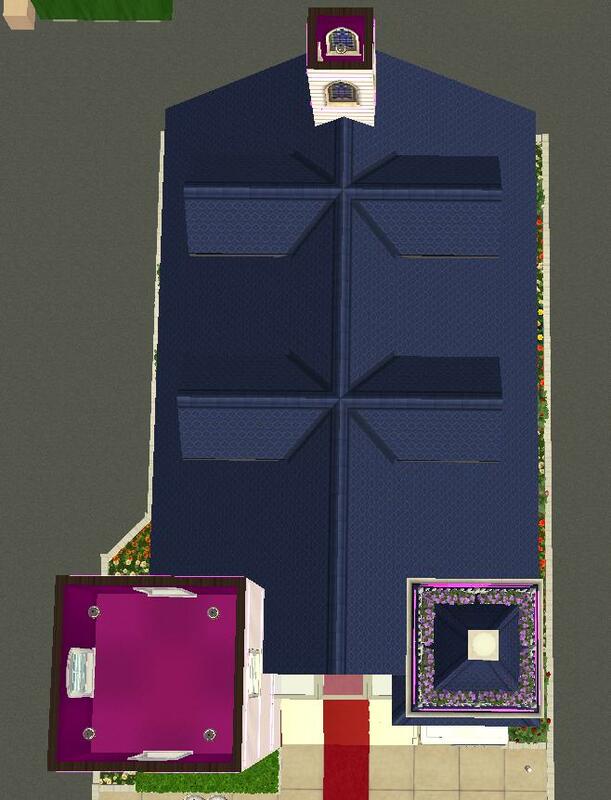 First, there's the most well-respected of all of SimNation's flatbed trailer formalwear stores, Mama Hicks' "Chic Wedding Boutique!" Thanks to our new commercial partnership, even if you're in such a rush to start married life that neither the bride or groom has had time to think of what they'll wear on their big day, you'll have no trouble finding a wedding dress to make all those mean girls in highschool jealous, or a tuxedo to make all the other dudes at the wedding think "Huh. A tuxedo." 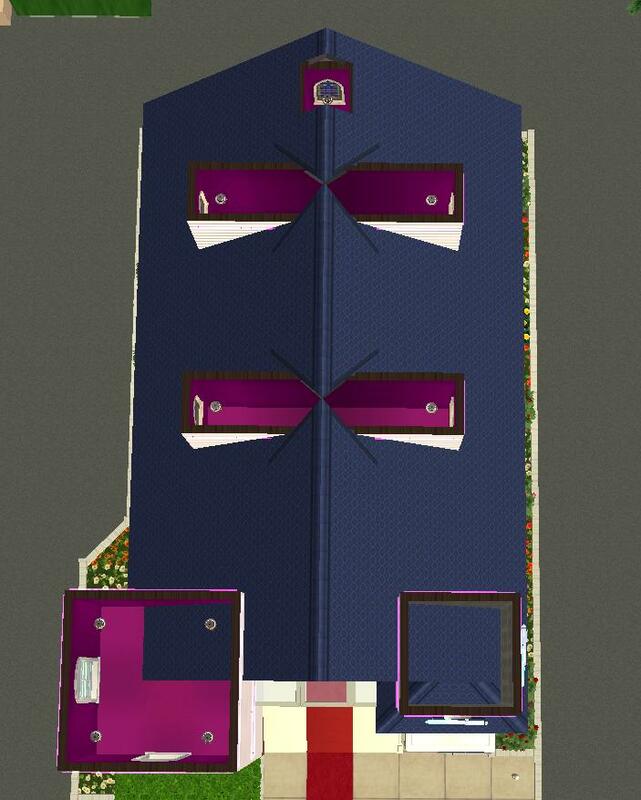 Mama Hicks hopes that, whatever style you want for your big day, you'll pay her travelling trailer showroom a visit before the festivities kick off! 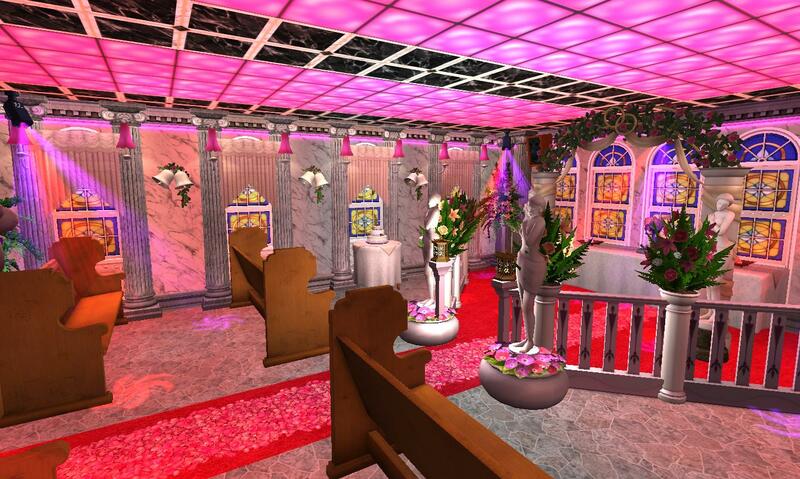 We hope that you will enjoy your wedding day, and we thank you for choosing to spend it with us here at one of the Neon Bouquet Wedding Chapel company's many beautiful chapels. Congratulations, and best wishes! OK, the brochure is over- it's me now. 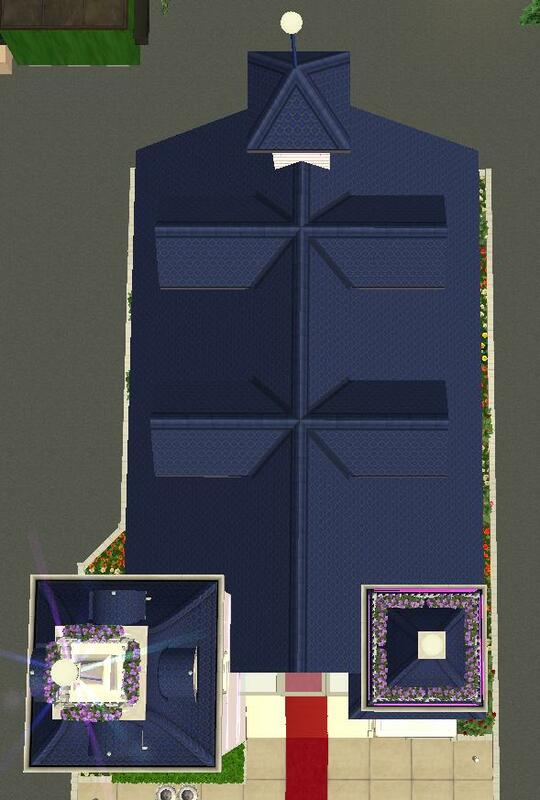 I wanted to put together a community wedding lot in time for Valentine's Day that wasn't just the stereotypical rows of pews with a rosepetal path running through them, up to an altar at the front (although I suppose I still have all of that here), and as I was thinking of how to make a lot that would jump out more, my mind strayed to the bright neon lights and outrageous displays of Las Vegas- thus was this drive-thru wedding chapel born! 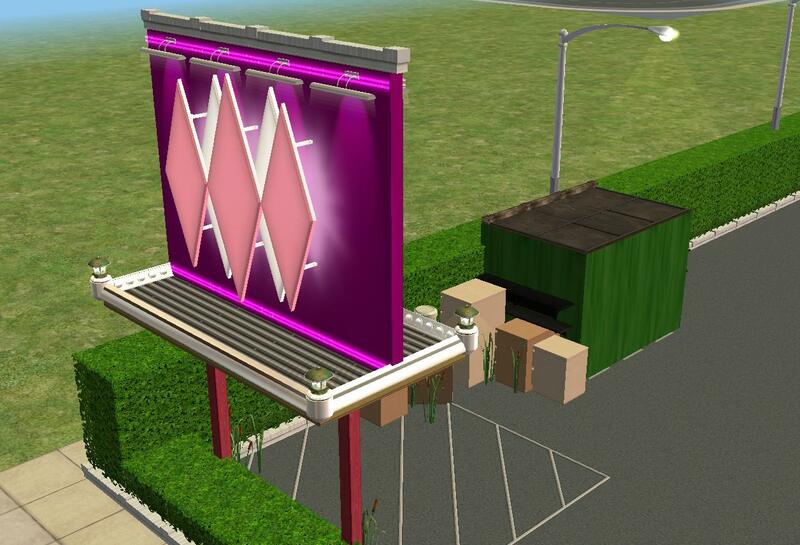 I tried to make the actual walls of the building such that they would look like a normal church, but the lot itself is really meant to conjure up ideas of fast food chain restaurants- dumpster out back, billboard signs advertising the place to people passing by on the street, that sort of thing. 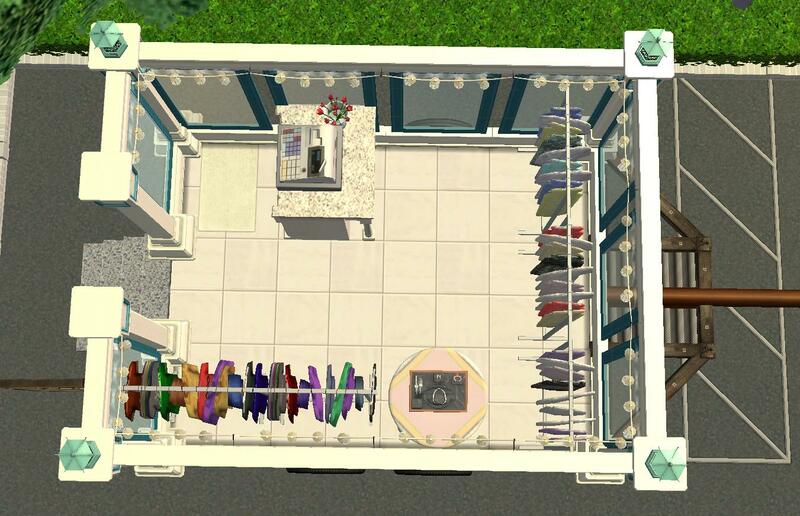 I also realized that, for a community wedding lot, it would be nice to have a place for Sims to dash in and buy a down-to-there bridal gown, a powder blue tuxedo, or (for those really poor Sims) a t-shirt with a tuxedo printed on it, (sidebar: seriously- why has no one made that t-shirt for their Sims yet? ), but I didn't want to draw anything away from the carefully organized neon monstrosity that I hope I've achieved with the main church. The obvious solution? 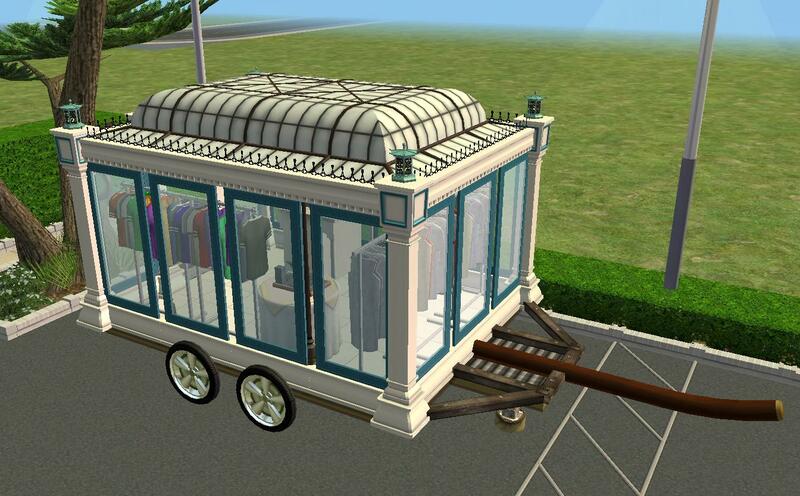 A flatbed trailer with a travelling formalwear boutique built right on top, left in the parking lot! Tacky enough for ya? 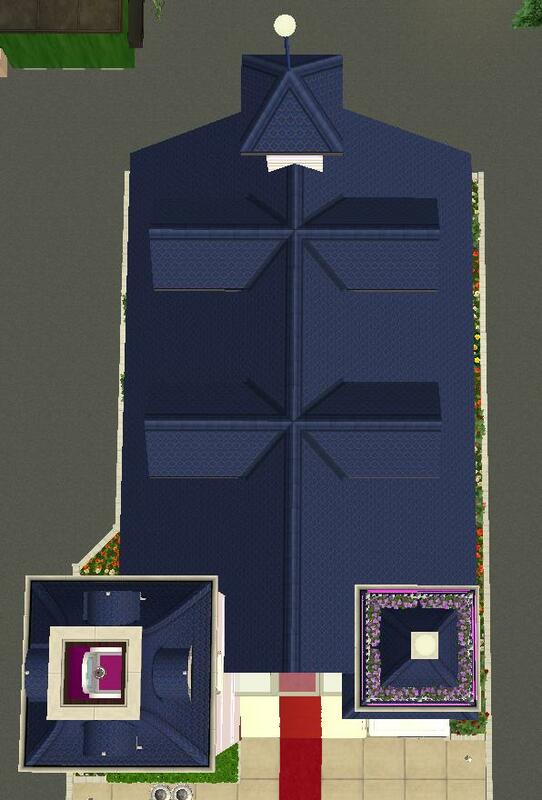 Hopefully your Romance and Pleasure Sims will enjoy the cheesiest weddings in SimNation on this lot! As per usual, this lot is totally CC-free, and a clone of it has been tested, with no major issues becoming readily apparent. Of course, if you find any, by all means, let me know, and I'll do what I can to address them. 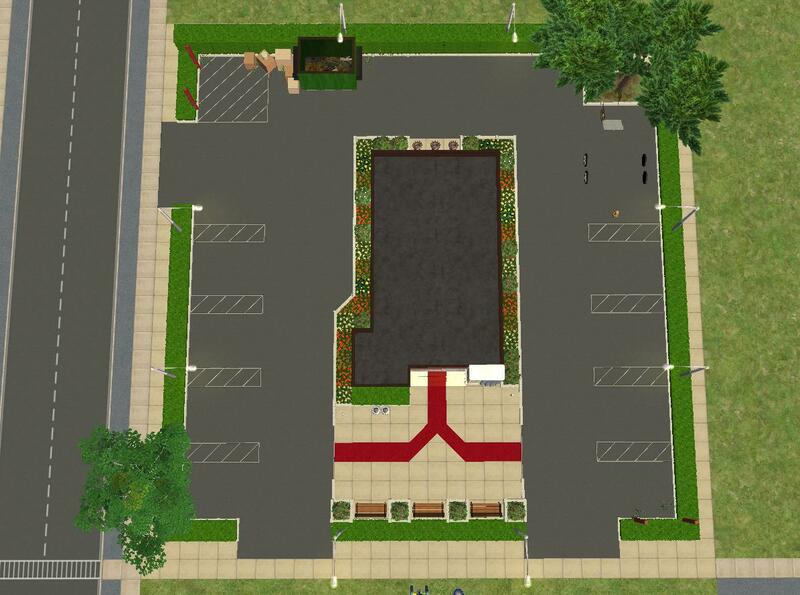 As it sits, this lot is designed to go on a street corner (there's actually three driveways and two roadside billboards on two sides of the lot- you may want to use move_objects to place asphalt tiles to actually connect them), but if you want it in the middle of a block, just fill in the hedgerows on the lefthand side of the parking area. I think that should cover everything- enjoy!